For most people, "cozy" has a certain connotation. It's usually thought of as being rich in colors and textures, like a traditional cabin set somewhere in the woods. That's why this bedroom design by Lisa Diederich is so interesting: it's every bit cozy, but still effortlessly light. A cool color palette of blacks, grays, and whites sets a peaceful tone, while plants on either side of the bed give the look a layered mix of height and texture. Meanwhile, a pair of matching side tables in a natural wood finish complement the breezy vibes of those plants, as mismatched table lamps add a touch of character to the otherwise symmetrical design. But what's truly inspiring us to call it a day in a space like this is the killer styling of the bed. Crisp white sheets paired with a chunky knit throw offer comfort without the clutter, which in turn allows the gorgeous velvet pillow to take center stage with its striking color-block finish. It's proof that cozy can also be used to describe a clean aesthetic. 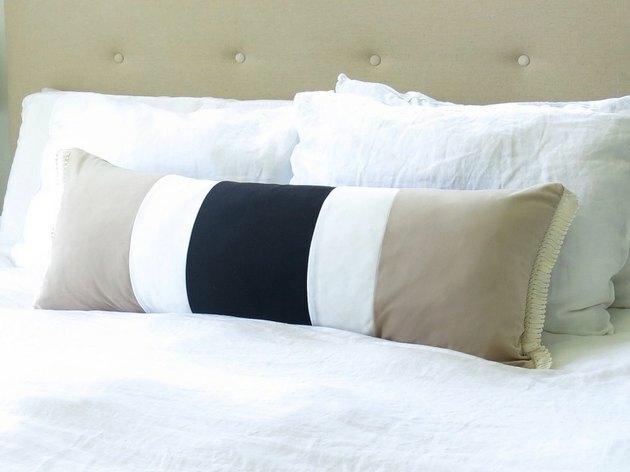 You only need one custom pillow to make a big impression.